Deans Birthday full of surprises!! After debating which of the many places we have visited or have yet to visit, Dean finally chose to discover the delights of this quaint restaurant in Southsea. Dean and Clair had visited the restaurant before the invention of Grubgang and upon stumbling on their website, decided it was the venue to go to! So, he phoned to book a table, pleased that for £18.50 we would receive a 4 course meal within Grubgang budget. He left a message on the machine and 2 days later received a call which interested him even further.....Would we be interested in their wine tasting evening, 5 courses and 5 wines to sample for the incredible price of £23.50 each. After consulting the gang on the price slightly over budget, the table was booked! Entering the venue, you are welcomed by friendly staff and pleasing decor. The downstairs has recently been refurbished and is very welcoming to the eyes. You could see these evenings are popular as the bar area where we were asked to wait was brimming with hungry guests. In fact, the tables were a little cramped, making Mike a little uncomfortable at times.Once we were seated, the anticipation rose as the chef addressed the customers to explain what was on the menu and which wines would accompany the dishes. This evening was a taste of south America.......Argentina, Chile and Californian wines with traditional dishes to suit. First, we were tempted by a tapas dish admittedly "thrown" together by the chef who had forgotten it was 5 courses! Blue cheese mixed with creme fraiche served with bread and caramelised honey cashews. If this was thrown together, we couldn't wait to try the following dishes! Next, prawns served in an iceberg lettuce leaf with chilli, lime, guacamole, tomatoes and red onions. Even Clair and Gemma who aren't big chilli fans found this course to their liking! Next, chicken with a chocolate and chilli sauce served with coriander rice........not for everyone but definitely an unusual combination. The chicken was a little dry also, but the rice was light and fluffy. Now onto the red wine dish....a beautiful cut of sirloin steak cooked medium rare with a groucho sauce...delicious!!! Served with sweet potato mash, this course proved to be a winner!! Then, to end the culinary delights a large profiterole, served with Belgian chocolate ice cream and a white chocolate sauce. Clair definitely rates the ice cream!!! Of course, no review here would be complete without the facility test. Unfortunately, poor Gemma encountered wet feet as she used the ladies as the toilet had leaked. They were not in the best of repair, but as the owner/chef told us he was renovating upstairs soon. We must also take time to mention Carl, the wine guy! He was fantastic, coming casually to your table to discuss the wines and our opinions. He was very knowledgeable and friendly, not in the slightest intruding. The owner/chef also came to the table, sometimes even serving a course to you. We had a brilliant evening and would recommend one of these wine and dine evenings to anyone. They are done on a monthly basis, but you cannot find details on their website, so it would pay to ring and ask for details. It does get very busy, so early booking is essential...... the Grubgang will go again for certain. Its a must for wine enthusiasts as well as those not afraid to be surprised by not knowing the menu until you get there. Well done Dean and a very Happy Birthday... good choice! What a fabulous restaurant - just like being in France!!! This is an interesting restaurant with an amazing menu, and great fixed priced deals, so everyone knows what to expect on the night!!...... 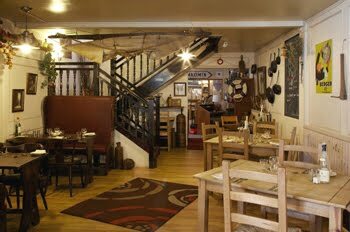 The food is good quality, I recommend you try the mussels if that is your thing!